It will therefore, I think be admitted that the present volumes, in which I have endeavoured to give a full and unprejudiced history of the Women Bonapartes, call for no apology; and I may even venture to believe that, whatever their shortcomings, they will be welcomed by the English and American public as an attempt to fill a place in our Napoleonic literature which has been long vacant. Letizia Ramolino—History of the Bonapartes of Corsica—Carlo Bonaparte—His marriage with Letizia Ramolino—Birth of Joseph Bonaparte—Letizia and the confessor at Bastia—Enthusiasm of Carlo Bonaparte for Paoli and the cause of Corsican independence—Cession of the island to France—The Bonapartes at Corte—Outbreak of the war between the Corsican patriots and France—Courage of Letizia, who follows her husband throughout the war—Adventures of the Bonapartes after the battle of Ponte-Nuovo—Carlo Bonaparte makes his submission to France. Birth and infancy of Napoleon—The house of the Bonapartes at Ajaccio—A sartorial mishap—Increasing family of Letizia—Financial position of the Bonapartes—Character of Carlo Bonaparte—His extravagance and ostentation—His infidelities—Character of Letizia—Her self-sacrifice and devotion to the interests of her children—Her religious principles—Anecdotes of Napoleon’s boyhood. Exigencies of Carlo Bonaparte—The Comte de Marbeuf, military commandant of Corsica, and the Bonapartes—Question of Marbeuf’s relations with Madame Bonaparte considered—Joseph and Napoleon leave for France—Napoleon at Brienne—Visit of Letizia to France—Birth of Maria Annunziata (Caroline)—Marianna (Élisa) receives a nomination for Saint-Cyr—Pecuniary difficulties—Carlo takes Marianna to France—Lucien goes to Brienne—Illness and death of Carlo Bonaparte. Poverty of the Bonapartes at this period—Heroism of Letizia—Exertions of Napoleon on behalf of his family—He returns to Ajaccio on furlough—Pauline Bonaparte—Napoleon in Paris—His visit to Marianna at Saint-Cyr—Lucien returns to Ajaccio—The Revolution in Corsica—Return of Paoli—Napoleon and Louis at Auxonne—Death of Archdeacon Bonaparte—Napoleon a candidate for the lieutenant-colonelcy of the National Volunteers of Ajaccio and Talano—Humours of a Corsican election—Affray at Ajaccio—Napoleon returns to Paris—Character of Marianna—She leaves Saint-Cyr with Napoleon for Corsica—Adventure with the sans-culottes of Marseilles. Marianna and Admiral Truguet—Paoli or France?—The Bonapartes decide to remain true to France—Embarrassing results of Lucien’s eloquence—Civil war in Corsica—Adventures of Napoleon—Courage of Letizia—The flight from Ajaccio—A perilous journey—The Bonapartes leave Corsica for France. 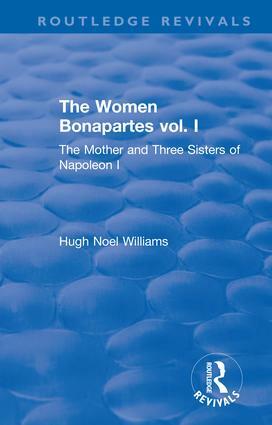 Early days of the Bonaparte family in France—Their distressing poverty—Gradual improvement in their circumstances—Napoleon, made general of brigade and appointed inspector of coast fortifications, invites his mother and sisters to join him at Antibes—Madame Bonaparte and her daughters—Indiscretions of Élisa and Pauline at Marseilles—Life at Antibes—Adventure of Pauline—Marriage of Lucien—Marriage of Joseph—Napoleon imprisoned—Junot a suitor for Pauline’s hand—Napoleon as matchmaker—Vendémiaire 13. Madame Bonaparte and her daughters return to Marseilles—Matrimonial schemes of Letizia—Lucien arrested and imprisoned at Aix—Efforts of his mother to secure his release—He is liberated—Napoleon is appointed to the command of the Army of the Interior—His marriage with Joséphine de Beauharnais—Indignation and alarm of the Bonapartes—Visit of Napoleon to Marseilles—Letter of Letizia to Joséphine. Pauline and Fréron—Career of Fréron—He resolves to marry Pauline—Her infatuation for him—Diplomatic conduct of Napoleon and Madame Bonaparte—Disgrace of Fréron—Pauline declines to abandon her lover—Her passionate letters to him—Scandal raised by a woman who claims to be Fréron’s wife—Napoleon orders his sister to renounce all idea of marrying Fréron—Pauline’s pathetic letter to her brother—Napoleon sends for her to come to Italy. Élisa and Félix Baciocchi—They contract a civil marriage, at Marseilles, in spite of the opposition of Napoleon—Madame Bonaparte, the Baciocchi, Caroline, and Jérôme set out to join the general in Italy—Their journey—Betrothal of Pauline and General Leclerc—Reunion of the Bonaparte family at the Castle of Montebello—Wedding of Pauline and Leclerc, and ecclesiastical marriage of Élisa and Baciocchi—The marriage-contracts—Joséphine and M. Hippolyte Charles—Antipathy of the women Bonapartes to Joséphine. Dispersal of the Bonaparte family—Caroline—She accompanies Joseph and his wife to Rome—Her sojourn there—Murder of General Duphot by the Papal troops—Return of Joseph and his relatives to Paris—Caroline is sent to Madame Campan’s pension at Saint-Germain—Louis Bonaparte and Émilie de Beauharnais—Madame Bonaparte at Ajaccio—Her letters to Madame Clary—Birth of a son to Élisa—Pauline at Milan—Birth and baptism of her son Dermide—She comes to Paris—Her success in Society—She attends Madame Permon’s ball in “a toilette which is intended to immortalise her”—But is cruelly humiliated by a rival beauty. Madame Bonaparte, accompanied by Louis, arrives in Paris—Wealth and consideration enjoyed by the Bonaparte family in 1799—Town and country residences of Joseph, Lucien, and Pauline—Pauline’s jealousy at the admiration which her younger sister Caroline is beginning to arouse—Growing antagonism of the Bonapartes to the Beauharnais—War à Voutrance decided upon—Imprudent conduct of Joséphine during her husband’s absence in Egypt—Return of Napoleon—Joséphine accused, but acquitted—Exasperation of Élisa and Pauline at their enemy’s escape—Madame Bonaparte and Pauline on Brumaire 18 and 19—Scene at the Théâtre Feydeau. The Bonapartes after Brumaire—Joachim Murat—His military career—Murat and Caroline—Napoleon desires to marry his youngest sister to Moreau, who, however, declines his proposal—The First Consul’s opposition to the marriage of Murat and Caroline overcome by Joséphine—Probable motive for her intervention—The marriage takes place at Plailly—Politic conduct of Caroline in regard to Joséphine—Insufferable arrogance of Murat after the campaign of Marengo—Courage displayed by Caroline on the night of the explosion of the “infernal machine”—Birth of her son Achille—Murat and the Pope—Caroline joins her husband in Italy—Installation of the King of Etruria at Milan—An unpleasant dinner-party—Return of Caroline to Paris—Murat purchases the estate of La Motte-Sainte-Heraye, in the Deux-Sèvres, and the Hôtel Thélusson, in Paris. Madame Bonaparte declines the First Consul’s invitation to take up her residence at the Tuileries—Extraordinary secrecy which she maintains in regard to her investments—Her parsimony—She goes to live with Joseph Fesch in the Rue du Mont-Blanc—Her relations with Joséphine—Stormy scene between her and her daughter-in-law, at the Tuileries, on the occasion of the first disgrace of Lucien—Her letter to Lucien—Her protection of Corsicans—She views with strong disapproval the marriage of Louis with Hortense de Beauharnais—Élisa in Paris—Her occupations—She takes charge of Lucien’s children after the death of their mother—Her literary and artistic pretensions—Sensation aroused at the wedding-dinner of Junot and Laure Permon by her appearance in the costume of a ladies’ literary society which she has just founded—Her mortification at the disgrace of Lucien—Nature of her intimacy with the poet Fontanes—Her letters to her brother during his residence at Madrid—She goes to the Pyrenees in search of a “cure”—Prosper de Barante’s account of his meeting with her at Carcassonne—She plays in tragedy with Lucien at Plessis-Chamant and Malmaison. Pauline and Leclerc—Leclerc receives the command of the expedition to St. Domingo—Position of affairs in St. Domingo at this time—Toussaint l’Ouverture—Amusing scene between Pauline and Madame Junot—Reluctance of Pauline to accompany her husband to the West Indies incorrectly attributed to an infatuation for the actor Lafon—Her innocence of all responsibility for the delay in the starting of the expedition—Stanislas Fréron a fellow-passenger with the Leclercs on the Admiral’s flagship—Arrival at Cap-Français—Apparent subjugation of the island—Duplicity of Toussaint—Outbreak of yellow fever among the French : terrible mortality—Calumnies against Pauline—Her courage and sang-froid in the midst of the perils which surround her—French insurrection of the blacks, who invest Cap-Français—Pauline refuses to take refuge with the French ships in the harbour, and has to be removed from her house by force—Repulse of the negroes—Illness and death of Leclerc—Pauline sails for France on the Swiftsure—Fresh calumnies—Arrival of the Swiftsure at Toulon—Honours paid to the remains of Leclerc—Pauline returns to Paris. Élisa purchases the Hôtel Maurepas—Chateaubriand becomes her protégé—Her conduct in the affair of the Due d’Enghien—She intervenes on behalf of the Royalists compromised in the conspiracy of Cadoudal and Pichegru—Caroline in Italy—Her husband is appointed Governor of Paris—Enviable position of the Murats—The Hôtel Thélusson—Calculating conduct of Caroline—An abominable calumny—Machinations of Caroline to prevent the First Consul’s adoption of Louis Bonaparte’s little son, Napoleon Charles, as his heir—Napoleon and Achille Murat. Pauline after her return from St. Domingo—She purchases the Hôtel Charost, in the Rue Faubourg Saint-Honoré—Her despair at the retired life which the First Consul insists upon her leading—Her flirtation with Admiral Decrès—Napoleon offers his sister’s hand to Francesco di Melzi, Vice-President of the Italian Republic, who, however, declines the proposal—Prince Camillo Borghese in Paris—Diplomatists as matchmakers—A marriage between him and Pauline negotiated—Refusal of the First Consul to permit the ceremony to take place until his sister has completed a year of widowhood—Mariage de conscience celebrated, at Mortefontaine, without his knowledge—Indignation of Napoleon at the deception practised upon him—The legal marriage—Visit of the Princess Borghese to Joséphine—Her departure for Rome—Lucien Bonaparte and Madame Jouberthou—Fury of the First Consul on learning that his brother has married the lady—Madame Bonaparte espouses Lucien’s cause, but without success, and resolves to withdraw for a time to Italy, as a protest against Napoleon’s severity—Letizia and Joséphine—Singular scene at a family dinner-party at Mortefontaine—Lucien’s imaginative powers—Madame Bonaparte sets out for Rome—Extraordinary consideration shown her by Pius VII and the Papal Court—Napoleon disapproves of his mother being received en souveraine—His letter to the Pope.